PetSmart will be having a one day sale starting on Friday at 7:00am. It looks like they will have a lot of items at 50% off. Here is a sneak peak at the PetSmart Black Friday Ad. Below are a few of the top deals from their ad. 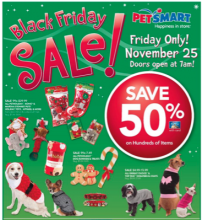 Offers Nov 20, 2011 in BlackFriday, pets, PetSmart · Expired! PetSmart: 15% Off Entire Purchase and Pet Hotel Stays!